Parts business today is not a reactive and support business entity. Parts Department is contributing proactively to OE's Top Line and more so the Bottom Line. As the Business scenario evolves the business processes and systems have to take a quantum leap to support the growing business needs. Created with a vision to enable Enterprise wide utilization of engineering data for instant & effective Interactive between organization's entire value chain - Internal and External (customers & dealers) by utilizing an amalgamation of Engineering CAD data, Internet Technologies and databases. We have a copyright on this solution. 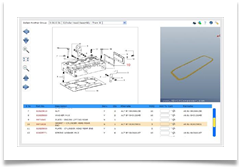 This software product uses technology to capture engineering information on very thin files and populate them on web pages which are linked to engineering databases. The entire matrix of knowledge that is created is dynamically linked to the underlying BOM information thus creating a connected environment which updates engineering changes as soon as they are applicable in the organization. 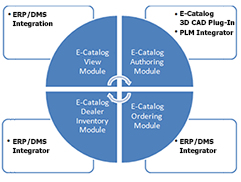 Modular Product Structure: Hi-Tech’s e-Catalog provides the Parts department a complete Roadmap for a complete Parts Business Automation.